Our new dinosaur is Diane's first foray into designing an exclusively metal sculpture. The sculpture stands 10 feet 8 inches tall and is 21 feet long weighing approximately 1,500 pounds! 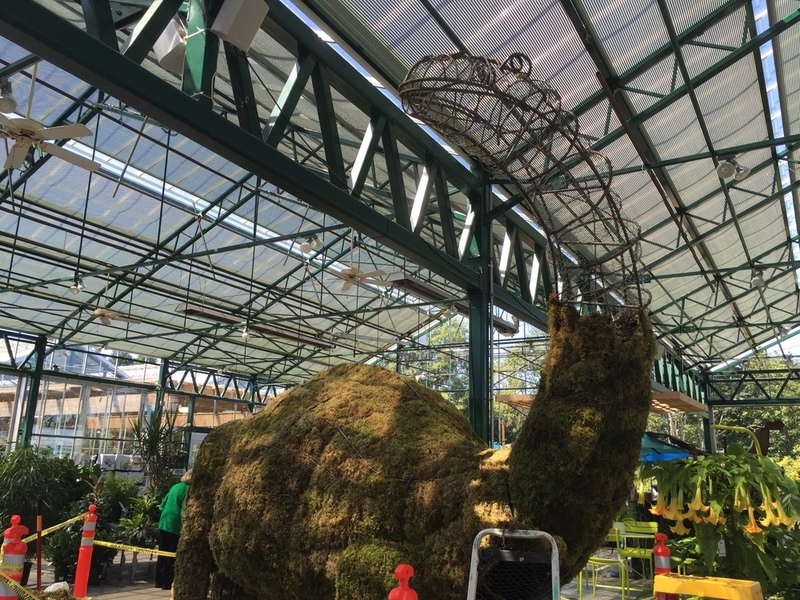 It took a team of over 10 people to bring our new dinosaur to life using cold-rolled metal and a chicken wire lining. Here's Diane and one of her team of dinosaur builders standing next to the newly-installed sculpture. She told us she was inspired by the space of the pavilion: "I wanted him to have a curious look as he peered around his new surroundings." 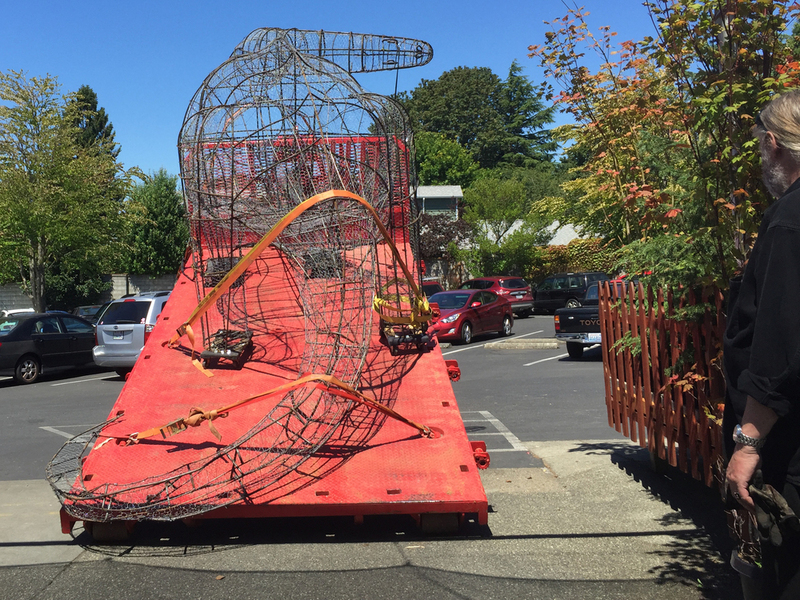 It was quite an adventure bringing the dino into the pavilion, not to mention the surprised gasps it must have elicited as it rode down the freeway on a large flatbed truck! 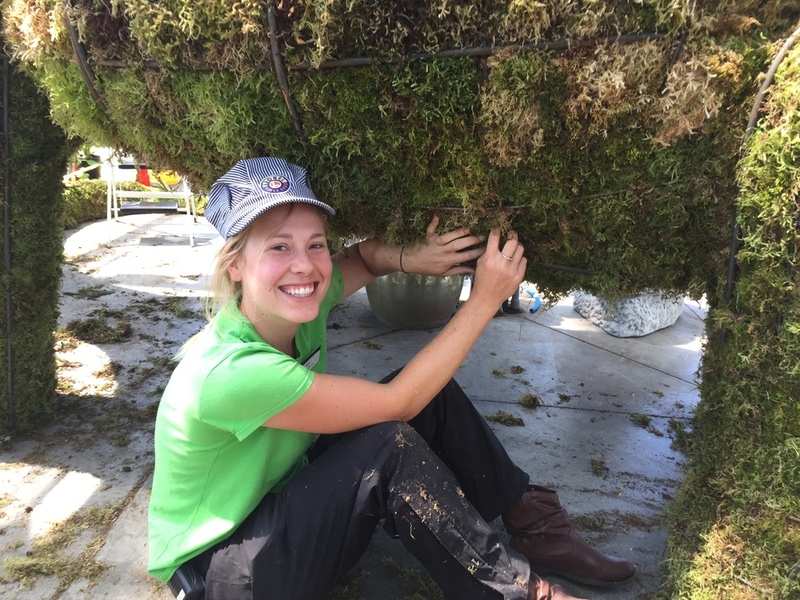 Once it was wheeled into place, it's legs were weighted down and a team of Swansons' employees spent most of a week carefully "mossing" our visitor, to give it a luxurious green coat. 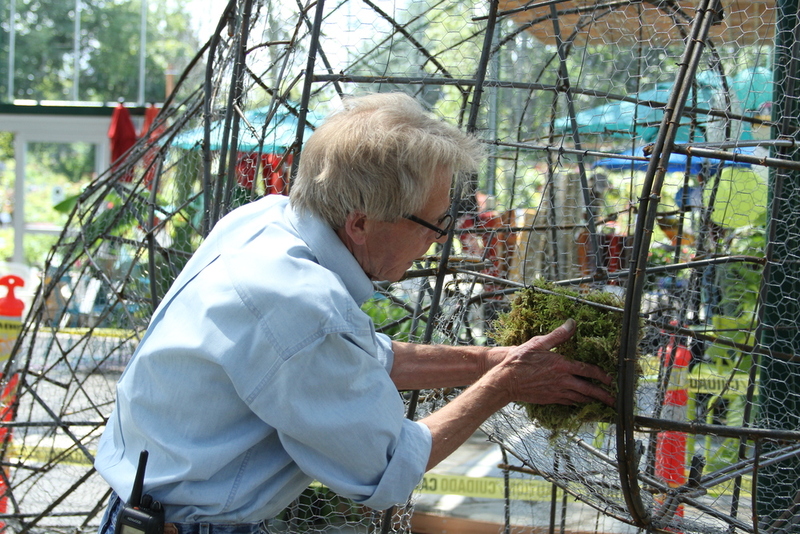 Diane paid careful attention to his wire musculoskeletal composition so that when the moss was overlaid, his spine and body would come to life. Our team also went to work to create a jungle wonderland of indoor plants around the dinosaur so it won't feel out of place. Thank you to Annabelle! We thought the name she picked was just perfect. Meet Annabelle. She chose our dinosaur's name: Humphrey! Humphrey is an Apatosaurus, a dinosaur who lived 154-150 million years ago in the Jurassic Period, and is one of the largest animals ever to have walked the earth. Our dinosaur is not quite life-size since the Apatosaurus reached a length of 75 feet, but we think our newest addition is pretty impressive! Be sure to stop in and visit Humphrey and, while you're here, pick up a copy of our dinosaur activity booklet for kids. It has fun facts about the Apatosaurus and activities to do at home. Bring it back in when you're finished and you can get a special prize!